On the site you'll find a collection of CSS Demos, along with HTML5 Templates for you to add your own content to and basic HTML5 layouts for you to style and use. If you're having trouble with any of the demos or templates, or with any other CSS, get in touch and I'll take a look for you. I apologise for any broken links on the site - I've been very neglectful of Grains Of Sand over the last year, but an updated site is coming soon, so thanks for bearing with me. 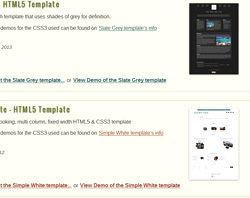 A collection of free website templates, built using HTML5 and CSS3. All you need to do is add your own text and images. 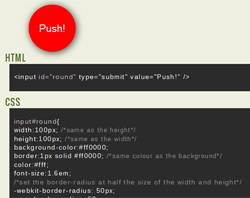 The downloadable files are heavily commented to help you customise them as you require. 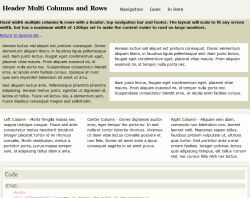 Basic and more complicated HTML5 and CSS3 layouts. Style them yourself, with your owns colours and images and then add your content.